To make it easier for Google Apps administrators to manage their users, services and devices, [Google] recently announced a redesigned Admin console. Two weeks ago, [Google] made the new Admin SDK available to developers who want to build customized tools for organizations that use Google Apps. 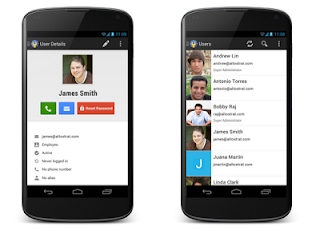 Today [Google is] launching the Google Admin app for Android devices. The Admin app makes it easy for admins to use their Android phone or tablet to accomplish the most common tasks—such as quickly adding or suspending users, resetting passwords, managing group memberships, and directly calling or emailing specific users. This app is designed for admins and requires API access to be enabled. Install the Google Admin app from Google Play. To learn more or contact support, visit the Help Center.